The concept of progress as the fourth sign of being propounded by Advayavada Buddhism is a controversial one because most other forms of Buddhism shun life in one way or the other. The conventional signs or marks or basic facts of being in traditional Buddhism are three: impermanence, suffering and selflessness, usually listed in that particular order. Impermanence (anitya in Sanskrit and anicca in Pali) refers to the unstability and transitoriness of all things, including ourselves; suffering (duhkha, dukkha) refers to the existential sorrow that all non-liberated human beings are prone to; and selflessness (anatman, anatta) refers to the fact that nothing has an enduring self or independent substance. In Advayavada Buddhism, we name those three conventional signs of being in a different order: first impermanence, then selflessness, and finally suffering. This seems to us more logical, because it is generally agreed that existential sorrow, which is also the first of the four noble truths of Buddhism, occurs when the facts of impermanence and selflessness are not fully recognized and understood. The second noble truth affirms, indeed, that all such suffering is brought about by a thirst (trishna, tanha), i.o.w. a craving or clinging, which is produced in turn by that fundamental ignorance (avidya, avijja) of the true nature of reality - in Buddhism, ignorance of the true nature of reality, i.e. of its impermanence and selflessness, is correctly seen as the root cause of all ill. It is indeed obvious that all existential sorrow and conflict, be it at the level of the individual or of the group to which he or she belongs, stems from the non-recognition of the facts of impermanence and selflessness, from not understanding and accepting that everything changes and nothing lives on. Out of sheer ignorance also personalities, ideas and beliefs are accorded indefinite validity, and compromise, consensus and change are felt by many as an infringement upon their integrity. Religious, ethnic and nationalist convictions have no regard for the lessons of History. Could the zealots, the fanatics, the flag-wavers but hear the scorn and condemnation, and even ridicule, that their actions will receive in future generations! It is already more than two and a half thousand years ago that the Buddha uncovered the reason for this sorry state of affairs and pined for a way to overcome it. 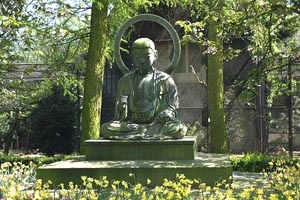 His solution to the problem, contained in the third and fourth noble truths of his most essential teaching, is, as we understand it, surprisingly simple and common-sensical: people must eliminate their thirst or craving, which is the immediate cause of their suffering, by following, and teaching their fellows, an intelligent, open-ended path which is, instead, in complete harmony with the true nature of reality. The method created by the Buddha, the Buddha's Middle Way devoid of extremes as understood by us, has no beginning nor end and is very adequately depicted by the Wheel of the Teaching (dharmacakra, dhammacakka). When followed conscientiously, it becomes nothing less than the main karmic factor in one’s share of the universal interdependent origination process (madhyamaka-pratityasamutpada): when we have meditated well, new and better insight will arise in our minds, and we are asked to organize and lead our lives in accordance with that renewed insight, until we observe (seventh step) that we and the circumstances in which we are embedded have again changed, and it is time to think things through again, and even to start afresh if necessary. Our contention is, now, that if the Buddha's path means, as it does, real progress at last and is in complete harmony with the true nature of reality as a whole becoming over time in its manifest direction, it then follows very clearly that, expressed purely in terms of human perception and experience, reality as a whole progresses over time as well. In other words, that progress is all life's inner driving force and, therefore, the fourth sign, mark or basic fact of being. Kwan-yin symbolizes the goodness of all life's inner driving force. Continue to Questions & Answers (edited selection). In Nederland: Gelieve uw vrijwillige bijdrage te storten op rekening 81.44.72.079 t.n.v. de Advayavada Stichting, te Amsterdam. Elk bedrag is welkom. Hartelijk dank!